Hi John how are you ment to know what text to write in the boxes if it’s not a device ? For example the stop button or play? That's a good point, unless you know the inner workings of the LOM (Live Object Model) you will not know. We probably need a reference page for this. I'll get to work on it soon. "how would I do a reaction to set a loop in and loop length on a highlighted track"
This should be possible with Reactions but I'll need to figure it out. Let me get back to you. This should set the Loop Start position of the currently highlighted clip. This means that your end loop position will always be 0.25 further along than the loop start. Hi John please give an example of what this would look like in control surface pro. Listener is the button, condition is view? Then what goes in the reaction boxes? Yes, Listener is the button. Has anyone else been able to get the loop start and end to work on a highlighted clip? Loop on and off also. I’ve had no luck? So I just tested this and work for me. One thing to note, the button you are using needs to also be attached to another mapping otherwise the required code doesn't exist which the Reaction hooks into. Reactions were designed to add feedback, you're adding new functionality (which is fine but requires a bit of a work around). The attached screenshot are the settings for the above demo. I attached 'button 1' to the metronome so that the Reaction can hook into it. Sorry it didn't upload for some reason. I've attached the screen shot and to make life easier for you, I've attached the script.json file, import it into your CSS. In answer to your question above, no you don't need to link it except for selecting the same button for Metonome and the Reactions. Did you get the loop start / end to work then? no i couldnt get it to work but do i just change the text in the box then leave the end box empty for the clip start. should there be a loop referance in there? So it’s loop position and loop length in relation to the play head that I’m after. Everything else should stay the same as in my previous screen shot. Thanks for explaining that John I’ll give it a go tonight. Hi John I have tried adding the word position in that script but can’t seem to just activate just the loop brace as in the position and length. 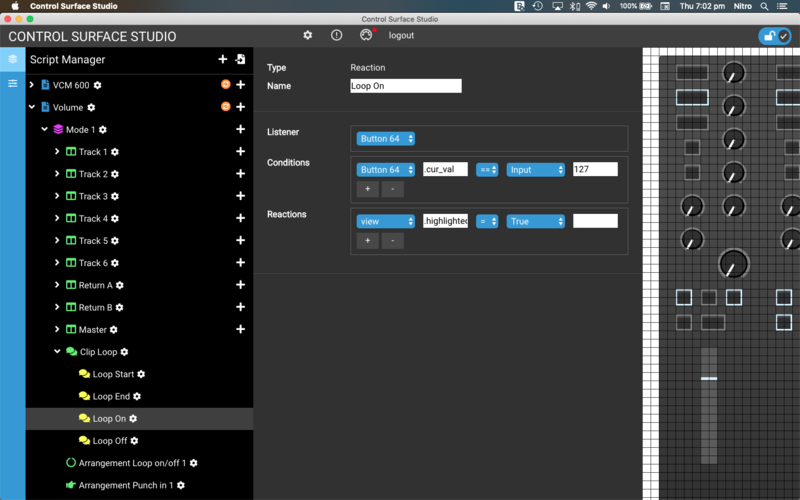 They are available in Ableton MIDI mapping so they should be accessible through the script. Do you have any ideas? They should control the 'set' the positions that you're after. To use the same button to toggle the Loop on and off, you need to add a Condition to your 2 Reactions. For this example i'm assuming your button is 'Button 1' and sends Velocity Values '127' for On and '0' for Off. Now your Loop On Reaction will only fire when your Button sends a Velocity Value of 127. You can do the same for your Loop Off Reaction but use Velocity Value of 0. "you would think that start_marker and end_marker would be for the clip"
Yes it is for the clip, I thought from your previous comments that's what you were looking for? am I wrong? Yep I want the loop position and loop length because they control the loop brace start and end so I can loop a section of the the track on the fly like on a cdj. Now when I put loop_start and loop_end as you suggest earlier it actually moves the clip start and end? Then if I put start_marker and end_marker nothing happens. But it’s the loop markers I want to set and that is done by pressing the loop position set box below the loop on off box and to set the other end I press the loop length set box. I can of course midi learn it and it works but that defeats the idea kind of. If clip's loop is turned off, loop_start &amp; loop_end control the start and markers. If clips's loop is on: loop_start and loop_end control the loop start/end as expected. start_marker and end_marker always control start/end markers. Hey John, Have you take a look at my questions about led feedback? I kinda struggle with finding a solution. As Blair here I'm trying to get led feedback from when I press transport buttons. The led feedback from when i turn on/off devices works perfectly. And I would need something similar for transport buttons, mute tracks. For mute track I can make the LED to turn on but I don't know how to turn it off. The tutorial you gave with listening to a button and send specific values just does not work. Even for the LED to turn on I had to have no condition but I'm guessing that for the same led to turn off I would need a condition. Hi John I have nearly got the clip loop to work properly apart from the loop on and off. I understand about the condition how ever as soon as I add a condition it stops working? My button puts out a midi value of 127 while you press it and 0 when you finger is off. But when you press it a second time ie to turn the loop off it fires 127 value. Can I still do it from that button? The script has a true setting for on and a false for off do I need that in the condition? I’ve tried with how you have written it above however as soon as I add a condition the script stops working. Reaction : view .highlighted_clip_slot.clip.looping = true then the end box is empty. This works and turns the loop on. The loop stops working? That’s the correct value I’ve checked. So what am I missing? I need the loop to work on and off on the one button 64 but any condition I put in stops it? Are you getting errors in your Error Log? You will need 2 separate Reaction Mappings, 1 for turning the loop on and another for turning it off. Each Reaction Mapping should contain 1 Condition each. Yes it seems that Buttons / knobs etc don't actually have .value. You could try using .cur_val instead, this will probably send an error to your log on first press (as it doesn't exist until after first press) but will work after. For your Condition it would be better to test if the Loop is True/False. If the Loop is true, set to to False and vice versa for the other Reaction. Button 64 .cur_val = false 127 ? Automatic / Default LED feedback. Tell us your requirements here! Tips for Mapping MAX For LIve devices?